Award winning service. Twice named “Company of the Year”! Top rated on Trip Advisor. Colorado's 'Recreation and Tourism Company of the Year'! 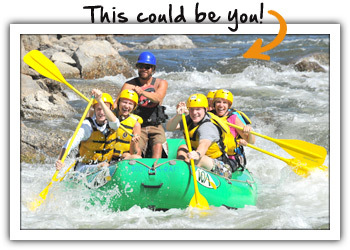 Wilderness Aware Rafting offers ½ to 10-day rafting adventures on the Arkansas, Colorado, Dolores, Gunnison, and North Platte rivers. Specializing in self-contained wilderness multi-day trips and half & one day trips on America's most popular rafting river—the Arkansas. Horseback riding, downhill mountain bike trips and zipline tours. New 7200-sq. ft. riverside facility offers first class amenities. Wildwater and family whitewater. Group rates.